A close-up of the pattern fragment printed in the molded and painted oval. A close-up of a second pattern fragment printed in the molded and painted oval. 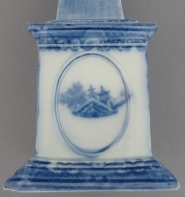 A rare pearlware obelisk-shaped ornamental printed in blue with small portions of a Chinoiserie pattern and with a butterfly or moth motif border printed on the molded base and top of the plinth both of which have been identified as Minton's Trench Mortar pattern. 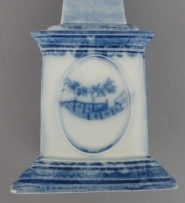 This type of ornamental can frequently be found with overglaze painted designs, but late 18th century underglaze printed examples are rare. It may have been part of a garniture set.